I am trying to keep my eye on the spectacle and the counter-spectacle that make up this most complex and politicised of all World Cups. My Twitter is full of Ninja media accounts of injured journalists and pepper spray attacks by the police on Argentines in Buenos Aires, but also exclamations of joy from inside the stadiums, and nationalism in the fan park of Manaus, and Brazilians chanting for Croatia in the free viewing areas set up by social activists in Rio. Social media makes these juxtapositions, previously invisible to us, tangible and present. 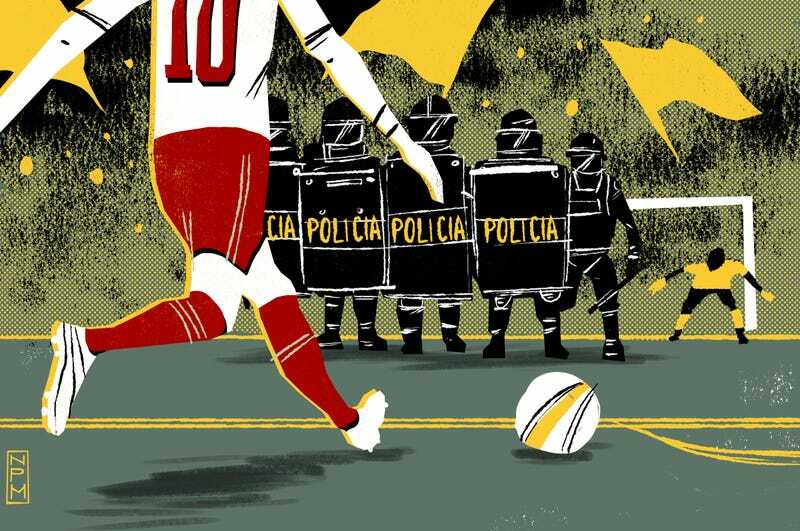 At precisely the moment that the FIFA congress was watching a video announcing their cooperation with the Nobel Foundation and the creation of the FIFA Handshake for PeaceTM, reports were coming in of forceful police raids on social activists across Rio and multiple pre-emptive arrests. Making a virtue of necessity, I decided to try to watch two streams simultaneously: ITV's coverage of the Uruguay vs Costa Rica match in Fortaleza and the Ninja media live feed of a small anti-World Cup demonstration in central Belo Horizonte. Technically, the spectacle won hands down—the bizarre use of the goal line technology graphics in completely uncontentious cases is a bit odd, but the range of camera angles, clarity of focus, and sheer quality the super slo-motion sequences is exceptional. The Ninja feed was an altogether clunkier affair, with much buffering and pausing, but this is like comparing a studio photograph of a bowl of fruit to a cubist still life. In fact that's pretty much what the Ninja feed felt like: a modern art film, shot at odd angles, with rapid cuts and changes of perspective on a single scene. A line of helmeted municipal police on a pedestrian crossing, their dense unbroken line of riot shields strung in front of a belle époque municipal palace; fragmented sequences of action form a small march; citizens being stopped and searched. Making sense of two visual streams was surprisingly easy, not much of a leap from the viewing and monitoring of game and social media that is becoming the norm inside and outside the stadium. The soundtracks, however, were truly dissonant. On the one hand, a mixture of urban fuzz, beating helicopter blades, and crackling Portuguese commentary on the demonstration and the occupation of urban space by the security forces; on the other, the inanity and small mindedness of commentator Andy Townsend occasionally punctuated by the rightful jubilation of the Costa Rican contingent in the crowd. In the end, I chose to watch the soccer and listen to the demonstration. This way of watching and listening to soccer is really not for everyone, but if you are in the mood for modernist experimentation, if you are feeling torn in any way by this World Cup, you might give it a try. As the spectacle becomes ever more skillfully staged, there is something to be said for some amplified distortion and jarring feedback. David Goldblatt is the author of The Ball is Round: A Global History of Football. He'll be contributing columns for Screamer throughout the World Cup.